I was inspired to make a vegan version of this soup when I saw a recipe in the new Cook's Illustrated magazine. Don't let the name fool you, this is not served at Italian weddings. 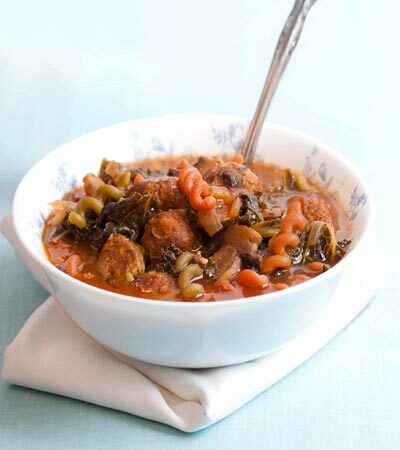 Wikipedia says of it's origin, "The term "wedding soup" is a mistranslation of the Italian language phrase "minestra maritata," which is a reference to the fact that green vegetables and meats go well together." This soup has so much going on to delight your taste buds. 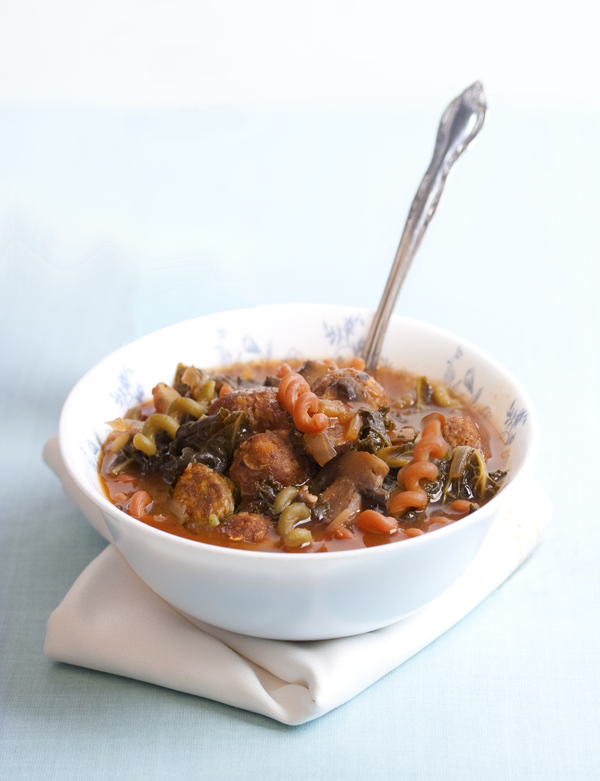 The "meaty" and chewy meatballs, kale, vegetable corkscrew pasta, mushrooms and the savory broth for all of this to swim in. Want to know what others thought about this recipe? Would you like to comment on this recipe? Go to the Vegan Italian Wedding Soup blog entry. The meatballs need to be prepared differently for this soup. Omit 1 Tablespoon of the olive oil and replace it with 1 tablespoon of water. We want to make the meatballs smaller for this soup so instead of making the meatballs with 2 tablespoons for each meatball measure them out using 1/2 a tablespoon. Also, cook 10 minutes on each side instead of 15 minutes like the recipe originally states. In a large pot sweat the onion, mushrooms and garlic with the olive oil and 2 tablespoons of the soy sauce, on medium heat, until the onions are transparent. Add to the pot the water, kale, cooking sherry, fennel, Italian seasoning, garlic and onion powder, bay leaf, sugar and liquid smoke and the rest of the soy sauce. Cook this for 25 to 30 minutes, until the kale gets done, on medium heat, covered. The last 5 minutes of cooking add the corkscrew noodles. Last, add the meatballs and tomato sauce and turn the heat up to high and cook an additional 3 minutes.